Jacques Chirac - one of France's most senior figures whose political career spanned several decades - has been found guilty of corruption dating back to his time as mayor of Paris. His extraordinary career at the pinnacle of French public life ended on 16 May 2007, after two terms as president and prime minister. Now, aged 79 and no longer protected by the immunity of his presidency, the elder statesman of French politics has been convicted of embezzlement, conflict of interest and breach of trust, all of which he denied. Mr Chirac himself did not appear either at the trial or for the verdict, after a medical report found that he was suffering memory lapses. He asked the Paris court for his lawyers to be allowed to represent him. Although Jacques Chirac's career has been dogged by accusations of corruption, politicians of all colours distanced themselves from the trial at which the prosecutors themselves asked for the charges to be thrown out. Jacques Rene Chirac was born in 1932, the son of a bank manager who went on to become managing director of the Dassault aircraft company. He served in the French Army during the Franco-Algerian war in 1954. Inspired by General de Gaulle to enter public life, he was educated at the elite Ecole National d'Administration, and flirted with communism and pacifism. The 1960s saw him as an assistant to the Gaullist Prime Minister, Georges Pompidou, who marked him out for high office and made him a junior minister in 1967. It was another president, Valery Giscard d'Estaing, who made him prime minister for the first time in 1974, a post he held for two years before resigning. In 1976 he founded his own party, the RPR (Rally for the Republic), which later joined with others to form the Union for a Popular Movement (UMP). His period as mayor of Paris from 1977-1995 was interrupted in 1986-88 when he returned as prime minister for his famous cohabitation with Socialist President Francois Mitterrand, who seemed happy to trip up the right-wing government at every opportunity. Finally, in 1995, with Mitterrand dying and out of the running, he won the presidency itself, having stood and lost in the 1981 and 1988 elections. One of Mr Chirac's nicknames has been Chameleon Bonaparte. Another is La Girouette - the weathervane. At one point an anti-European Gaullist, he became a champion of the single currency. He fought the 2002 election on a soft-left platform promising to "heal the social fracture", but then appointed a finance minister of the "Thatcherite" right. He ordered nuclear tests in the Pacific, then came over all green. "Chirac wolfs down everyone else's ideas, and then - phut!" said former environment minister Brice Lalonde. What of the political nous attributed to him by admirers? In 1997, Mr Chirac dissolved the National Assembly a year early, despite having a strong right-wing majority. His supporters promptly lost the election, and Mr Chirac had to spend the last five years of his first presidency sitting on his hands in so-called "cohabitation" with a Socialist-led National Assembly. During Mr Chirac's 18 years as Paris mayor, there were widespread claims that he and his entourage were using city funds to pay for the RPR. Questions were also asked about Mr Chirac's luxury family holidays - paid for in cash - while his tenure as mayor also provoked claims of lavish spending of the city's money on family groceries, at a rate of thousands of dollars a week. A ruling by the country's constitutional council in 1999 gave the president blanket immunity from prosecution while in office. When he appointed his former legal adviser as chief prosecutor of Paris, the decision was condemned by the opposition as it was a key post in launching any anti-corruption proceedings. While Mr Chirac initially escaped prosecution, former Prime Minister Alain Juppe and several other close allies were convicted of illegal party fund-raising in 2004. Mr Juppe was handed a suspended jail sentence, but has since returned to front-line politics as foreign minister. Many in France may remember Jacques Chirac as the man they chose, some of them very reluctantly, to defeat Jean-Marie Le Pen at the 2002 election, when the far-right leader reached the run-off in a shock development, at the expense of the Socialists' Lionel Jospin. In July 2002, shortly after re-election, he was the target of an apparent assassination attempt as he reviewed the troops on Bastille Day from an open-top jeep. 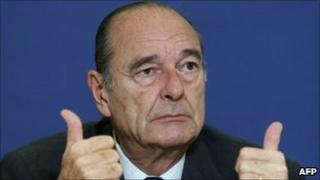 Although a bullet was fired, Mr Chirac on being told of the attack was said to have responded "Oh, really". One of his major political reforms was to cut the presidential term of office from seven to five years, bringing it into line with that of parliament, though it meant a shorter second presidency for himself. Abroad, the French leader was seen as the focus of opposition to the US-led invasion of Iraq in 2003. Although Germany was also against the war, Mr Chirac was most vocal in his insistence that any military action without UN Security Council backing was illegal. While his predecessor, Francois Mitterrand, was associated with various grand public projects such as the Louvre pyramid, the one public building commonly associated with Mr Chirac is the tribal art museum, Musee du Quai Branly, which he opened in 2006. Always something of a ladies' man, he once confessed to his eye for the women in 2007, shortly before leaving office. "There have been women I have loved a lot, as discreetly as possible," he said. His years on the political stage may also be remembered for his frank remarks about other countries, particularly the UK. In 2005, for example, he said of the British "One cannot trust people whose cuisine is so bad", although Finnish food, in his well-fed opinion, was Europe's worst.